Interoceanica SUR (iSUR) is an organization that works around the new Interoceanic Highway to integrate change and conservation. I spent the last 10 days on a tour of their projects near Puerto Maldonado in Lower Tambopata. They are working with private landowners here to create sustainable initiatives that create income for families, allowing them to preserve their land. 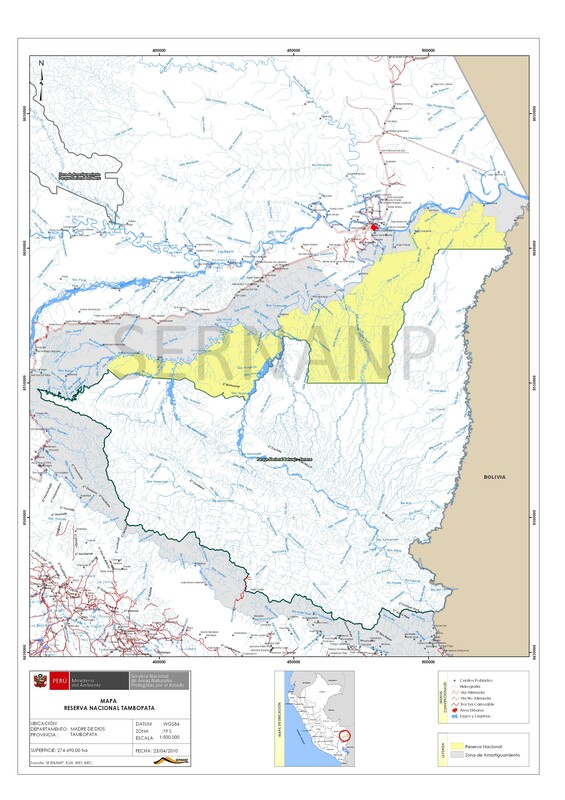 In this area, iSUR is focusing on the Tambopata Buffer Zone. Tambopata National Reserve is one of the largest reserves in Peru and it is adjacent to the new Interoceanic highway. Studies have projected that deforestation will take place within 50 kilometers of the new highway, deforesting the buffer zone and up to 20 kilometers into the reserve. To combat the projected deforestation, iSUR is working with private landowners in the buffer zone to create a solid buffer of forest that should resist future development around the highway. See below (the gray area is the buffer zone, the yellow area is the reserve, and the red line above them is the new highway). I visited 10 properties over the last few weeks, ranging from ecotourism lodges to an animal rehabilitation center. While we have conservation trusts and private land reserves in the states, they are virtually unheard of in Peru. With the help of iSUR, some of the very first private land reserves in the country have been created in the lower Tambopata region. One of these, amazingly, is owned by a dynamic 14-year-old Peruvian girl. These landowners have made the decision to preserve their forest without the promise of any benefits from the government (in the United States, conservation trusts lead to significant property tax reductions and other benefits). Overall, I had a blast and you can read about the whole experience in my journal (to be posted in 10 parts). Above you will find a few favorite images from the trip! That 14-year-old girl sounds really amazing, Gabby. This is such a fascinating project – at Middlebury we have a yearly summer scholarship prize called the Davis prizes for Peace, which funds projects that can be liberally designed to incorporate all kinds of environmental as well as humanitarian themes. I almost applied for it two years ago, and the proposal was all about the Interoceanic Highway – changes to impacted communities and landscapes. I decided to pursue a different path for the summer, but this has always been so interesting to me; it is pretty much the next best thing to be following your words and images on a similar adventure!